I do not complain, because you have to use while the season is on and, most importantly, when they are fresh. Frozen strawberries do not taste the same. None of the frozen fruits in my opinion have as good a taste than fresh ones. There is a high change that recipes with strawberries in the lead role will not end for now, as I am planning to go outside the city on Monday to the gardens, from where I will pick strawberries myself 🙂 Prices are much lower and the taste of those fresh, sun-drenched strawberries is unique. Ingredients You need to make potato dumplings. 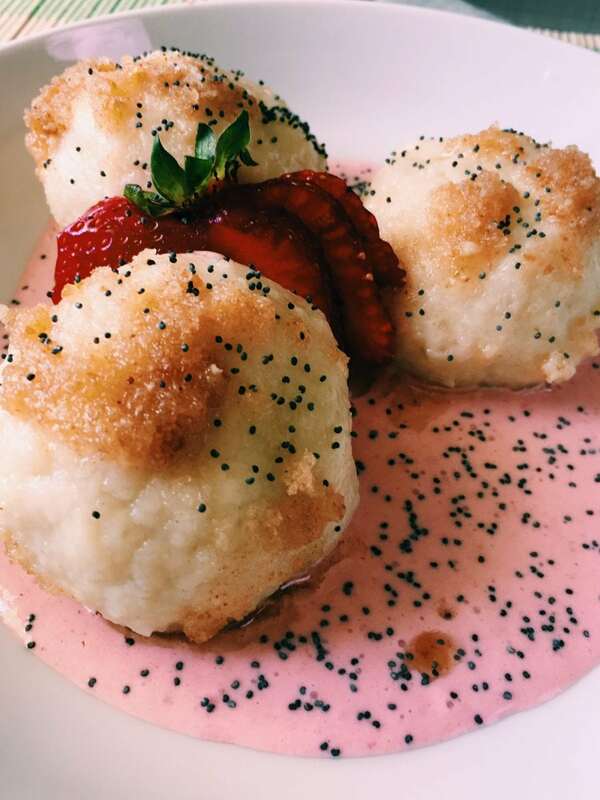 How to prepare potato dumplings with strawberries. First, peel the potatoes, cook them and while they are still warm, squeeze them through a potato ricer. Add flour and egg. Fold the pastry and make a three-centimeter thick roll from it. Cut it up into equal pieces of three centimeters. Flatten each piece on your hand then put the strawberry with a bit of sugar in the middle. Shape them into balls. Boil the dumplings in salted water for 4 to 5 minutes from the moment they start floating on the surface. Drain them and pour cold water on them to prevent them from getting sticky. Melt the butter and add the breadcrumbs. Fry for 30 seconds. Blend the remaining strawberries, add a teaspoon of sugar and double cream. Serve the dumplings with this strawberry cream sauce, butter and bread crumbs, and gently sprinkle them with poppy seeds. What You need to know when making dumplings with fruits. It is best to use medium sized strawberries. 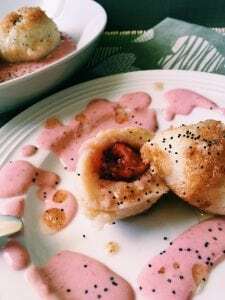 I had such big ones that I put only half a strawberry into each dumpling. Potatoes are the fluffiest when pressed through a ricer. If you do not have one, you can use a masher or mince them.